Michelle Ash is the Chairman of GMG and former Chief Innovation Officer at Barrick Gold. GMG is a member driven industry association working with members and industry participants to develop best practices and guidelines for the implementation of technology and socially enabled changes in the industry. In her role with Barrick, Ash oversaw the company’s Innovation program looking both at how innovation can drive productivity in the existing business as well as how it can be harnessed to deliver alternative business models. Ash joined Barrick in January 2016 and brings with her more than 20 years of experience in the mining and manufacturing sectors with a focus on business improvement and change management. She began her career as a blasting engineer with Rio Tinto. Most recently, Ash worked for Acacia Mining in Tanzania as Chief Operating Officer, having served earlier as Executive General Manager, Business Improvement and Planning. In these roles, Ash drove shareholder value by spearheading business improvement programs that resulted in operational improvements and cost-savings. Prior to this, she served as the Head of Alliance Planning and Co-ordination at the BHP Billiton Mitsubishi Alliance where she was accountable for the leadership of strategic projects. Ash has held similar business improvement and strategic roles at other companies including the Minerals and Metals Group and Australian Vinyls. Ash was named to the 2016 list of “100 Global Inspirational Women in Mining” by Women in Mining UK. Ash holds a degree in Civil Engineering and an Executive MBA from the Melbourne Business School; she also holds degree in psychology from Deakin University. 1. What lead you to the mining industry? I studied civil engineering and originally thought that I was going to be building bridges and cities, but when I graduated there was a downturn in the economy in Australia. Luckily, I went to one of those career seminars and a couple of mining companies including Rio Tinto and a few others had stools there. I wasn’t really interested in mining but a friend of mine suggested that I apply for Rio Tinto as they were doing some interesting work. I applied and funny enough they looked at my CV and were interested in the fact that I had done my honor’s thesis in fracture mechanics, which was about driving safety by extracting methane from underground coal mines. I was offered a role in Rio’s research section on alternative blasting products. I was then given a blasting engineer role at one of their mine sites. I was reluctant at first because I intended to be in the city but as soon as I got on to a mine site and met the people working there and once I got to see my work literally move mountains, it was so inspiring and exciting for me that I kept coming back to mining. I also worked 5 years running a petrochemical business which manufactured PVC and PVC products, and spent 3 years working in pulp and paper manufacturing but every time I got drawn back into mining. 2. How has your experience as a woman in mining been? I very rarely think about myself as a woman in mining. Most of the people that I’ve worked with think of me as a mining engineer or as someone trying to achieve a goal or help transform the industry. If I can reflect on it, I’ve had both sides of the coin. I’ve had instances where I worked for a site that had no female toilets which meant that we had to share the male toilets. I’ve had a couple of people in mining who have been threatened by me, not because I’m a female but have lashed out because I was female. But that is so rare – most of my experience in mining has been very positive and the people have embraced the differences as well as the similarities that I bring. My first leadership role in the mining industry was leading the truck shop and the guys working there saw me as an engineer, they didn’t see me as a female engineer. They responded very positively to the way I led them because of some of the more feminine qualities that I brought. I was a great listener and more likely to tell them what they needed to know about their performance because at the essence I want to help them improve. 3. What were some of the most defining moments of your mining career that helped you advance to senior roles? At the start of my career, I was pushing this manager to promote me to the next level up to a senior mining engineer or superintendent. He had done it with other people around me, but he said to me ‘Michelle you can’t do it until you’ve got some supervisory experience, you’re going to lead people on the ground before you step in into a superintendent’s role’. I remember being frustrated so he suggested that I get some experience overseas. He organized that I worked at two of Rio Tinto’s mines Palabora in South Africa and Rössing Uranium in Namibia and when I came back, I became a supervisor. At that time, I had to report to a superintendent which I had got on the least with. We had clashed several times over blast design and quality. It was hard for him to accept me because I was young, and he was the kind of guy who was older more experienced came from the ground up and didn’t like engineers. I ended up enjoying working for this guy because as I got to know him better, he was a lot more thoughtful about people and a lot more accepting. I think he accepted me more than I did so when I became a superintendent and was now this guy’s peer, we had a good bond and a great working relationship. This experience made me realize that you can’t judge people until you’ve been in the same work environment as them and that people can change and grow. Another defining moment was when was I stepped in to become a truck shop superintendent. I knew very little about maintenance and had to manage 200 people and was accountable for the trucks and wheel equipment. I was put into the role because the company wanted somebody who understood both mining and maintenance. I had done some technical reports on maintenance to try to bring those two groups together because we had some behavior issue between the two groups not trusting each other. Several people expressed their support for me to move into the role and they convinced me to take a chance and said that I would become more confident in the things that I could do. This experience taught me to take an opportunity that was presented to me and make a go of it. 4. You spent a couple of years leading Acacia Mining in Africa. How did that experience shape you? This was one of the most amazing experiences in my career. The Tanzanian people are truly wonderful people – they’ve got an amazing heart. I lived in rural Tanzania for two years. I learnt Swahili so that I can speak to people and spend time in villages getting to understand how the Tanzania people lived and worked. It was important to me as most of our employees came from those villages. When I first moved to Tanzania I was very nervous especially when I became the general manager (GM) of Bulyanhulu. At the time, the GM left so we needed someone to stand-in. I ended up standing-in for 12 months; I was doing the COO role as well as GM role concurrently. I remember when I first had to tell the team that I was being appointed as the GM. I was standing up on this podium and looking out at a thousand underground Tanzanian workers and thought that this could be a riot. This is the first time these guys will have a woman as GM and I was Australian – not the leader that they are used to. I stood and said to everybody that I had been so excited being in Tanzania because I had been welcomed to Tanzania just as though I had been welcomed into a family. And it just happened to be a speech that resonated with everyone. Tanzanian and especially the Sukuma people – the predominant tribe that worked at Acacia are very family oriented. The first guy that spoke asked: ‘how do we know that you are going to be a good leader? what are you going to say that you are going to be true in leading us?’ Before I could even answer the question, one of the other guys in the crowd turned to this guy and said ‘of course she’s going to be a good leader, she is a momma and we know that mommas will lead us true and they’ll tell us what we need to know but they also have a momma’s heart – this is the first time we’ve had a momma as our General Manager and she will be our General Manager.’ One of the reasons why women are so respected in Tanzanian society is because the women of the household have to make all the hard choices and all the good choices, so they are considered to have both a strong heart to make the hard choices as well as a soft heart to embrace and take care of the family. At the time, we did some great things. We started turning Bulyanhulu around. We worked with the communities a lot more, changed their views about mining. I was one of the first GMs to spend a lot of time in the villages, which was very important to the community and our employees who valued having the operation and the villages as one. 5. How did you advance your career to the C-suite level at Barrick? I started at Barrick as senior Vice President for business improvement. When we tackled innovation at Barrick we layered it in three ways. First was business improvement and putting the projects, the metrics and the processes together, and getting all the General Managers (GMs) focused on driving those improvements. We had put together a monthly meeting where all the GMs shared their achievements so that they could realize what was being done and how they could leap frog on it. Once we got that underway, we then focused on the digital and innovation strategy. I spent 8 weeks with my team looking at what would digital do to Barrick, what would be the value, and what would that transformation from a strategy perspective do. I then spent the next 8 weeks putting together what would the first five years of that strategy look like and very specifically the first two years. It was during that time that the chairman John Thornton really felt that he had to put emphasis on innovation and digital transformation, that it was so valuable to Barrick and to the industry that it needed elevation and that we needed to be the first company to have innovation at the C-suite level. And because I’ve been part of the business improvement and digital transformation he knew my capabilities and decided that it should be the role that I should take on. It was through his leadership that that came about. 6. Where do you see the value for mining companies to transform their operations and embrace new technologies? The value is in so many different places. At the highest level if mining companies don’t embrace technology and transform what they do to become more productive and more modern, we won’t achieve some of the things that we’re absolutely going to have to achieve. We’ll keep on this commodity cycle where we eke out through continuous improvement, make small changes in the production cost that just about matches the changes in the commodity price, but we won’t actually deliver good profitability. Good profitability is important not only for our investors but also for our governments and communities. It’s through that profitability that governments get taxation, communities get jobs and companies get additional funds to invest to support communities. Secondly, we have to embrace technology as millennials become more significant in the investor market places. I think millennials have very negative views on mining and there’s much more that we could do to not only change those views but also perform better. If we want millennials then Gen Z to come in the mining industry then we need to be very modern, and for those same group of people to invest in the mining industry we need to have modern outlooks as well. As we transform the industry some of those things that we thought are impossible will become possible. For instance, the ability to use no cyanide in gold extraction, achieve zero waste mining, use significantly less water etc. 7. From you experience as CIO, what’s the most challenging part in leading large transformations in mining? The most challenging part is convincing people across the business all the way from the board through to the operators and maintainers that the changes are necessary, will be beneficial and are achievable. Whether its convincing a board member that having a centralized data base that you can pull your information from and do AI over it is a necessary thing given that their experience might have been 20 years ago, or in the case of an operator who you are trying to convince that using an iPad to import their data and be able to see some metrics on how well their equipment is performing is something that can add value to their role. Once you start implementing the changes, it becomes about working closely with your customers. I like the agile methodology and the combination of agile with waterfall. Waterfall methodology in terms of setting up the strategy and the overall direction for the transformation and agile to work with the operators and their products in real time making sure to remove pain points. This methodology gets you significantly faster adoption and faster adoption leads to faster behavioral change, which is really what you’re trying to achieve with these technology implementations. It’s the behavioral change that drives the benefits and once you’ve got the benefits then you convince board members and senior leadership that the changes are possible and beneficial. 8. More generally, how do you see the mining industry evolving in the next years? What will be the short term and long-term focus? I think the short-term focus will be around automation, data pulling and artificial intelligence. More specifically, using artificial intelligence to augment people capabilities and getting more remote work so that people don’t have to work at the face or at the mine site. I think longer term we’ll start seeing number of these technologies merge together to create system-level innovation. What we’re doing now is very much point innovation so we’re automating trucks or we’re putting AI over processing plants. But once you get a system-level innovation, you can then start imagining a world with real time geological data, so you would know exactly what geology you’re drilling into; a world where applying AI to planning processors with equipment automated will enable real-time optimization and full control of the operations to either maximize middle output or minimize water usage. Once people start working remotely then you can fundamentally change the design of a mine. If you think about an underground mine today, one of the reasons the stopes are so big, or we spend so much money on ventilation is because we have people underground. If we start driving towards having no people underground, then we can radically change the capital cost. We might shrink the equipment down or just take the metal out, we might even be able to put the processing plant behind the cutting equipment and pump only a liquid up to the surface so that we don’t have big processing plant on surface, waste damps or tailings dams. Now you’re radically changing what mining looks like, you’re changing the capital cost, you’re changing the operating cost, and you’re significantly impacting the environmental footprint. Longer term as we’ll see a lot of these technologies merge, we’ll get the huge transformation and the huge benefits to mining. 9. What can the industry do today to bridge the gap with the tech industry and attract companies and startups from outside of mining? So many things! One is to have a desire and willingness to do so. My team and I spent a lot of time working with startups getting to understand them and their products – I can’t tell you how much I’ve had to learn about AI and robotics. Secondly is to educate leaders and educate people in the industry about these technologies. It’s in the education and willingness to try different things and to do it in a way that manages and reduces the risk. Trials should be low in cost and as close to the face as possible so that you are working with the customers. It is important to work in an environment that doesn’t put people at safety risks, which might require access to a trial mine site or have to simulate offline before trying in real life. Over the years our supply chain practices have been driven towards working with major companies, which is not practical for working with startups. If you put startups through a 6-month qualification period, require them to have insurances that aren’t practical or attainable for them, if your terms and conditions are such that you want to take the IP from them you’re going to preclude yourself from being able to work with startups and quite frankly miss out on some great solutions. So, we need to think about how we tailor our supply chain processes such that we avoid abuses but make it easier to work with small companies. If we want to be ahead of cost and community sentiment, we’ve got to increase the rate at which we transform our business, adopt new technologies, and adopt new behaviors and thus drive improved safety, productivity and quality outcomes. The only way to increase that rate is to embrace solutions that are outside as well as inside our industry. 10. Any advice to someone starting their career in mining? If anyone’s even thinking about a career in mining I would absolutely do it! The main reason I’ve stayed in this industry for so long is the ability that mining has to transform communities – mining is at the front line. Australia did not have much more than a subsistence farming economy up until 1852 when gold was found. By 1880 it was building roads, banks and universities all on the back of gold mining, which has expanded to include coal and iron as well as many other commodities, and now some of the ‘industry 4.0’ commodities such as lithium. I’ve seen it at the micro level where villages in remote African communities transformed thanks to revenue and royalties they got from mining. I think mining does help transform communities and take people out of poverty. It also helps governments. Norway is a great example of a government which used oil and gas funds and invested it wisely so that the whole population can benefit from it. Mining is also a wonderful industry to be a part of because of the great people you get to work and spend time with, and the amazing parts of the world that the industry can take you. You should be prepared to work rurally at least at the moment to get a good feel of the mine, the geology/geography, the communities and places where mining is done. It’s really a great industry and one that is changing faster than it has in the past! Isabelle is a geological engineer with over 14 years of professional experience in the mining industry across Canada. During her career, she has developed vast expertise in geotechnical and environmental engineering, more specifically in management and risks related to mill waste facilities, mine waters and waste rock. How did you choose to work in mining? Initially, I was interested in slope stability, avalanches, and earthquakes, which got me into studying geological engineering. It is then through a work term at an oil sands company in Fort McMurray that I discovered a passion for mining. My job consisted of rotating in different geotechnical positions with regards to tailings facilities and waste rock piles to replace the technicians while they were on vacation, which exposed me to a broad range of topics in geotechnical engineering. As we all know, Fort McMurray faces significant environmental challenges, and I decided to do something about it and help solve some of the environmental problems through my professional career. How has your experience of working in mining been? Very good! When it’s not in a downturn, the mining industry is fast-paced, and the work is both fun and fulfilling; you meet a lot of motivated people with energy and ideas. When the industry is doing well, there’s plenty of work for everyone, and that’s when you learn the most. When you’re tagged as an environmental person, you’re seen as someone who’s there to slow down the operation when really your job is to make sure that everything goes well to continue operating. So on top of being a woman and viewed differently because of that, I was also an environmentalist and suffered from that image. I overcame that by making the people I work with realize that I’m not there to stop them but to make things better in the long run. Through a better tailings management plan, things will go much smoother and fit much better with the operations. It takes a lot of technical knowledge and planning to do the job, and it’s important to show that to be respected. Tell us more about your current position and what you are most passionate about in your work. I am currently a geotechnical engineer in the mine waste management and environmental department for a consulting practice. This department is very new and has been active since January 2017. Its creation was driven by the company’s will to get into the environmental side of mining to close the loop on the services they offer. I am passionate about making a difference and using my technical skills to improve things regarding environmental and mine waste management. What are the most useful skills that you use at work? Technical skills. If you are not strong technically, you will lose credibility. This is even more so the case for women. As women, we don’t have it easy, so having strong technical skills helps us to make our way and be recognized. Communication is always important; I keep working hard to improve mine. If you have the technical ability, the communication, the planning and organizational skills, you pretty much have it all! But without the technical expertise, you’re out. Have you had mentors that have helped you? If so, how important were they? I’ve had quite a few mentors. Some of my mentors have helped me to push my technical ideas forward and get the budget to get them through. Other mentors have helped me to expand my expertise through a coaching relationship. How do you find the balance between work and personal life? There are two types of lifestyles in mining: the Fly-In-Fly-Out life and the city life. In the city, one can manage to get a work-life balance with the help of a handy daily planner. On FIFO, however, it’s more difficult. You are physically tired at the mine site and away from everyone, which can make you feel disconnected from everything; and when you fall on an off time, you have to make an effort to reconnect with the people that matter in your life while they are busy with their weekly schedules. I want to keep learning! At this point, I’m considered a young senior, but I don’t quite feel senior yet; I want to keep learning to earn that title personally. On another side, we often hear women not having the confidence to assume that they are ready. Why is it important to have more women in the mining sector? Diversity has been proven to increase productivity, respect among colleagues and ideas to solve problems. And there’s no reason today for men only to work at mines especially that technology has made mining jobs a lot less physical. 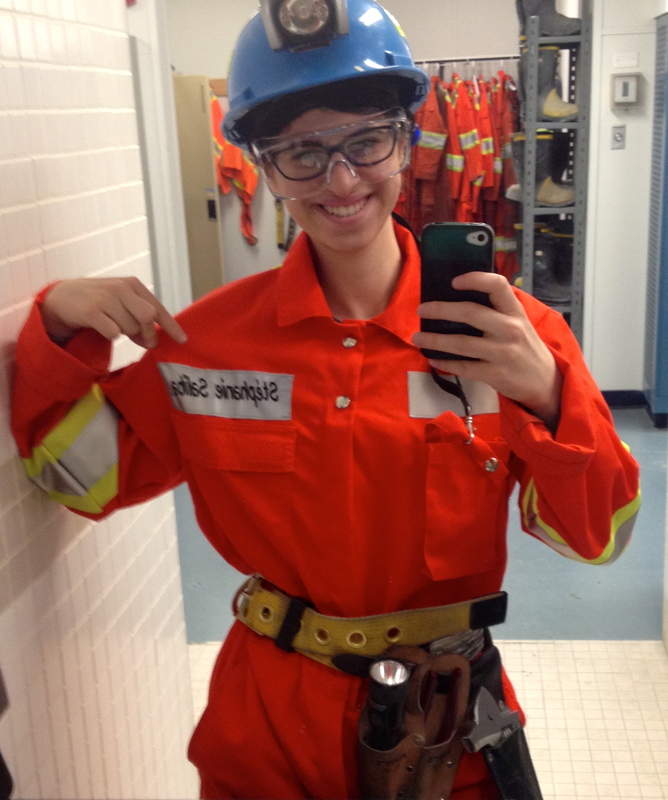 Any advice you could give to young women starting out in their careers in mining? If you can get a job at a mine site, I would suggest that you go for it because it’s where you learn the most. There’s always more work than available resources at mine sites. As an engineer, you’re going to balance operations, people, health and safety on a daily basis. You’ll also learn about the limitations from climate, logistics and even from strikes! Don’t limit yourself: go onsite, learn, and make good money! Louise Grondin is the daughter of dairy farmers and grew up in Saint-Nazaire-de-Berry, Quebec, working on the family farm. Louise recognized early on that she wished to pursue post-secondary education. Excelling in both math and science and fueled by her love of problem solving, she went on to study physics at the University of Ottawa. She later obtained a Master of Sciences degree from McGill and got her credentials as a mechanical engineer from the University of Toronto. After 12 years working for Ontario Hydro, she switched to mining in 1993. Since 2001, Louise has been working for Agnico Eagle Mines Limited. She was appointed Senior Vice-President of Environmental and Sustainable Development in 2010 and the human resources portfolio was added to her responsibilities in 2016. Louise is a key member of the senior management team that has led the growth of Agnico Eagle from a single mine regional gold producer to a multi-mine international leader in gold mining. Louise’s passion for contributing and promoting the mining industry garnered her several recognitions, including being named in the top 18 Women of Impact in the Canadian Materials, Metallurgy and Mining field (2015), one of the 100 Global Inspirational Women in Mining (2013) and winning the 2016 Women in Mining Canada Trailblazer Award. Why did you choose to join the mining industry after 12 years with Ontario Hydro? I was married to a mining engineer and we were both working in Toronto. My husband then got transferred to a mine in Abitibi, so we both decided to move from Toronto to a small village of about 300 people. At that time, mining was the only employer in this small village so if you didn’t work in mining, it was very difficult to find a job. I applied for an environmental superintendent position at the Selbaie mine and got the job! This is how I came to be in mining. What helped you advance your career at Agnico Eagle Mines to the position of Senior Vice-President? My attitude! The one quality I find very important in leaders is being positive and seeing the glass half full instead of half empty. Being positive was a natural attribute for me and people saw that. They also saw someone who could get things done. I am in fact a solution seeker and someone who works really hard and is very driven. What also played a role in my advancement was the growth of the company. I joined Agnico at a time when there was only one mine in operation and during the first 7 years after I joined, we expanded from 1 to 8 mines. I was there at a good time and could progress very quickly. I evolved from being the regional environmental manager to Vice-President of environment and with time, the health & safety, community relations and more recently HR portfolios were added. As the needs of the company became bigger, management counted on me. They thought that I could do it and look for solutions. What also helped is the fact that I am a team player. I don’t fight anybody, instead, I make allies; and that’s very important because you’ll need allies to support you along the way. In addition to my personal attributes, the combined strength of my team members and good timing of having joined Agnico at the right time were key ingredients of my career progression! It’s the positive impact we can have! I work in environment, health & safety, community relations and human resources, this means I work with people: employees and community. We operate in remote areas and have the potential to make a difference with the people we work with and the communities in which we operate. By providing work to locals, we offer them an opportunity to own a house and send their kids to colleges and universities. We are changing the social landscape of the areas where we operate by creating value for the people. We are in fact extracting value out of rock and transforming it into making good whenever we can; that’s often something people don’t realize. Our potential to have a positive impact in the remote areas where we operate is limitless! Moreover, when we go in areas where there has been no one before us, we study the environment and provide a lot of scientific information that is very valuable. It is information that universities or governments don’t have the capacity and money to provide so it is our responsibility in our permits to do it. Could you share a challenge you’ve experienced in your career and how you overcame it? When I first joined Agnico, we had a problem with our effluent. Our water effluent was toxic and it was a very complex challenge to solve because you had to trace the problem back from the end of the pipe up through the whole process to find out what was contributing to making that water toxic. It was like solving a puzzle! At that time, I was still new to the company and I had to quickly step in and have meetings with the ministry of the environment to address that challenge. It took us 2 years to implement a biological treatment plant to treat the toxic water. Bacteria are great and they can do miracles! But at the start, when we transferred the process from the laboratory to the pilot plant, the process didn’t work and I remember phoning technicians on weekends to check if there were any improvements. I still remember the day it did work and how proud I felt at that moment. What were some of the most defining moments of your career in mining that made you particularly proud? One of the things I am particularly proud of, and without doing it on purpose, is that I can hear my vision for environmental management and community relations from the mouth of our employees and the community. We recently did a video in Nunavut to celebrate Agnico’s 60th anniversary and after interviewing our employees up there and members of the community and hearing what they thought the company wanted to do in environmental management and community relations, I was amazed to hear that they clearly understood the vision that I had been trying to realize over the years. I might not have a structure on which I can put my name but the fact that the people in the community reflect back to me what I wanted to do is amazing! Have you had mentors that supported you along the way? If so, how important were they to your success? I had no one labeled as mentor but I did feel that my bosses had my back. I worked very hard and was very loyal to them. In my youth, I was more impulsive and they taught me to listen more and to think about what could a solution be before jumping into action as soon as there’s a problem. Also, they never doubted me. During meetings when issues were discussed, I would raise my hand to take on a challenge and I was never refused the opportunity to do so. I had a very positive attitude, which lead management to believe in my capacities to do the job. It’s very difficult! You’ve got to adapt your career to leave space for your family. When I had my children, I was on an 8 to 4 schedule and I would work when the kids went to bed. You’ve got to manage and people nowadays are much more understanding than back in the old days. There’s almost no difference today between men and women, they both have to pick up the kids, cook and put them to sleep. When I was younger, it was more difficult but I was still able to deliver. If you are passionate about something, you find a way to make things work and I guess that I didn’t give a too bad example: both my children are now in mining! I also have to add that my husband has always believed in me and was very supportive! We were never in competition with each other, but always partners. Looking at the population, it is made up of 50% women and 50% men. Mining companies need to welcome a more representative proportion of women because otherwise, they would be missing out on much of the talent. From my experience, women tend to be more collaborative and better communicators. Women also bring a more human side to the business, which changes the dynamics of a project in a good way. It is obvious to my male colleagues that we, as women, have something to contribute and it is a plus to have us around. Women are welcomed in mining, but the industry has not fully succeeded in showing that. Why has it been such a challenge to include more women in mining companies? Mining is still seen as hard rock mining and unsophisticated, which isn’t true! Yes there are some jobs that still require more strength, but most jobs are mechanized and the industry has become very sophisticated and technological. I can compare us to the construction industry, which, like mining, suffers from the same image problem that needs to be broken. What we also need to put emphasis on is the variety of jobs that mining provides such as in communications, environment, health and safety, HR, engineering, accounting and even nursing! We’re not doing such a great job at representing the variety and opportunities for women in mining. The women that are in the industry can be good witnesses of these opportunities and we should encourage them to be ambassadors of our industry. Any advice that you could give to young women starting out their careers in mining? When someone came to me and asked me what they should do to advance in their careers, I told both the men and women that if they do their job as if it were the most important job in the company, they will become important and people will notice them. I say that through my own experience: I have always been very dedicated. You have to be very confident that the fact that you are a woman is not going to hinder you; on the contrary. It might happen that you are going to feel, rightly or wrongly, that you are not getting that promotion because you’re a woman, but I would suggest not to dwell on the negative side and rather to challenge your boss and ask where you can improve! It all comes down to attitude. The McGill mining program is a coop program, which means that students not only need class credits to graduate but also 12 months of coop work experience. The first two years of my undergraduate studies were particularly hard to land an internship. The mining job market wasn’t at its best and commodity prices were falling. With hard work and the right skill set I finally signed my first contract with the Matagami Mine division of Glencore. I finished writing my final exams at the end of April and in early May I was already packing my bags for my next adventure. I left the city early on Saturday to arrive 8 hours later in the little northern town of Matagami. It was my first experience ever working in a mine, so I was wasn’t too sure what to expect. On my first week, I filled in my steel-toed boots, put on my coveralls and headed to the underground. It’s easy to know if mining is meant for you or not: you either love it or hate it. In my case, being underground felt like being in a different world and I loved it! It was fascinating to see how huge the excavations, the trucks, and the stopes were. Even though the mine is in operation since 2013, which is relatively recent (some mines are 100 years old! ), it’s already quite deep. It takes about 30 to 40 minutes to get to the deepest face in the mine that is 750 meters deep. I was hired as an intern in the engineering department to work with the team of surveyors. The team and I would spend the morning surveying up to 7 different faces in the mine. Because of that, I was exposed to all sorts of activities underground. I would encounter the Jumbo man drilling in preparation for a blast, the bolters that are bolting a newly excavated face of the mine to make it safe to work under. One thing that is very useful when underground is to spend time communicating with the miners. Showing interest in their work and asking questions was beneficial for me to learn about the challenges they face and to understand that an engineering design should be feasible to execute safely. After the survey is done, we would use the afternoon to develop AutoCAD plans based on the data gathered underground. These plans are used by engineers, technicians, and supervisors and are essential for the next round of operations. My stage was a great learning experience. As an engineering student, you mostly learn the technical aspects and everything is very theoretical. Seeing how a mine actually works gives a lot of meaning to the theory learned in the classroom. It is also crucial, as engineers, to understand how the operations are carried out in the underground and what challenges the miners face. And the most important thing in any internship experience is to have fun and learn, learn, learn!